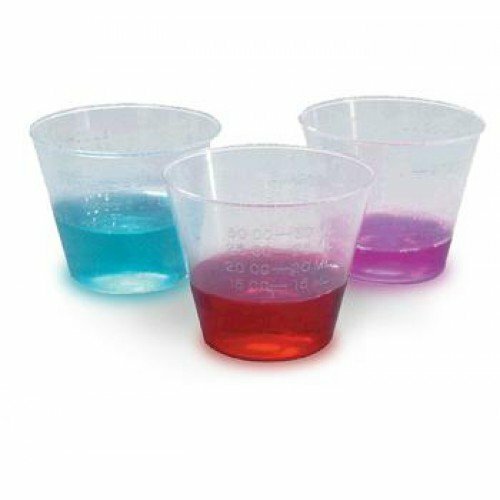 Premier Plastics Calibrated Medicine cups are used as a convenient way to distribute medicine in pill or liquid format. These 1 oz medicine cups are manufactured with unbreakable polypropylene by Premium Plastics. The plastic medicine cups are calibrated with easy-to-read increment graduations in ounces, cubic centimeters, milliliters, drams and tablespoons. Calibrated medicine cups are useful to ensure that the correct liquid dosage is achieved. These medicine cups can be ordered in a pack of 100 or a case of 1000. Save over $80 on your medicine cups by ordering a case. Are these cups a single use only product? I realize they can be washed out because they are made out of a durable plastic, but what is listed on the manufacturer packaging? These are considered non-sterile and therefore should not be used more than once. Can't beat the price. Perfect for taking liquid supplements or medicine that has to be measured. I've been buying these for years, because the price is decent and they were good quality. However, my most recent order is different from past orders. They don't even look like the ones in the photograph, and are much worse quality. If you're going to send a different product at least update the picture to reflect what they look like now. In our Adult Residential facility these cups are used 4+ times a day, by 15 residents. They are sturdy, and perfect for medications of all types. The value is excellent. Very pleased with the product. Delivery is always much faster than stated on order. We use these to dispense medication to patients. Great product! We are a non-profit, adult residential facility. We use these every day. Recently our pharmacy began sending 2 or 3 cups when we would ask for them. I guess they thought that was sufficient for the 12 people we give medication 4 times a day too. I could not find anyone that carried them in our area. These were exactly what we needed. Easy to read measurements, disposable, and inexpensive. tried to find these cups all over with no luck - finally found them on your website and was thrilled - taking care of an elderly parent and washing these little cups out everyday is time wasted - they are inexpensive enough that I can just throw them out after several uses - really appreciate that it gives me time with dad doing other things - highly recommend this website - have gotten many things that we needed too. Fantastic price and quick shipment, thank you. The calibrated Medicine Cups are excellent for disposable use. They are as substantial as any I have seen. The price is good. I am pleased with my purchase that arrived in record time. Thank you! These cups work great for mixing jewelry resin and the price is amazing! These medicine cups have been very useful. We were using tops of cough medicine and were excited to find these on line and at a great price!